4.2 out of 5 based on 155 bloggers and 8 commenters. 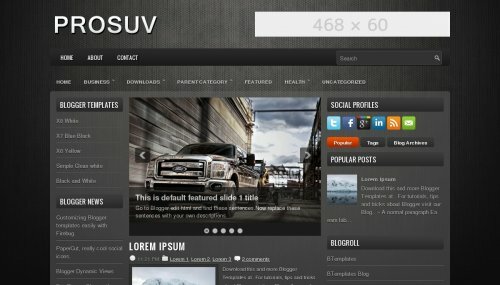 ProSUV is a free blogger template adapted from WordPress with 3 columns, left and right sidebars, ads ready, slider, social bookmarking icons, posts thumbnails, tabs and drop down menu. I has already used this template. It’s awsome..
1. I don’t use any page break, but why there was “read more” button in main page? 2. How suppose I do if I want those slides only appear in my main page? How do you get the date to appear in these templates. I have the date checked off to show in blog post settings (from layout) but it still doesn’t show, just the time. I also checked the settings as outlined on your FAQ page for date not showing and that does not fix it either. how do i edit a social to my own social profile? can i just copy and paste html code of template.will it work?